Target 1 Synchro Monster on the field; return that target to the Extra Deck, then, if all of the monsters that were used for the Synchro Summon of that monster are in your GY, you can Special Summon all of them. This card's effect is similar to that of De-Fusion, except with Synchro Monsters. Unlike De-Fusion, however, this card isn't a Quick-Play Spell Card. This card also has an Xyz Monster counterpart: Xyz Encore. However, it can only be used on the opponent's monsters. The picture on the card resembles that of De-Fusion and Polymerization, as a reference to how Synchro and Fusion Monsters are similar. The theme of wavelength and sound is also present. G.B. Hunter: While “G.B. Hunter” is in play, you cannot activate effects that would return monsters to the Extra Deck, such as “De-Fusion,” “De-Synchro,” or “Compulsory Evacuation Device” targeting a Fusion or Synchro Monster. Suppose that a Synchro Monster is flipped face-down by "Book of Moon" and then flipped face-up again. If it is targeted by "De-Synchro", then it returns to the Extra Deck, and you can Special Summon the Synchro Material Monsters from your Graveyard. : If "De-Synchro" is activated against a Synchro Monster which became face-down and then face-up, then can you Special Summon the Synchro Material Monsters? Suppose that a Synchro Monster is banished by "Interdimensional Matter Transporter" and then Special Summoned by "Return from the Different Dimension". 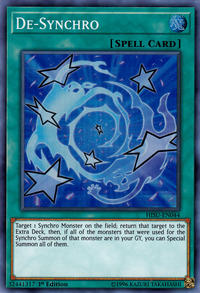 If it is targeted by "De-Synchro", then you cannot Special Summon the Synchro Material Monsters from the Graveyard. : Can "De-Synchro" target a Synchro Monster that was banished and then returned? If a Synchro Material Monster(s) is removed from the Graveyard and then sent to the Graveyard again, then it is no longer considered a Synchro Material Monster(s) and you cannot Special Summon any monsters with "De-Synchro". : With "De-Synchro", can you Special Summon a Synchro Material Monster which left the Graveyard, but is now in the Graveyard again? When resolving the effect of "De-Synchro", if the Synchro Monster is not returned to the Extra Deck, then you cannot Special Summon the Synchro Material Monsters from the Graveyard. 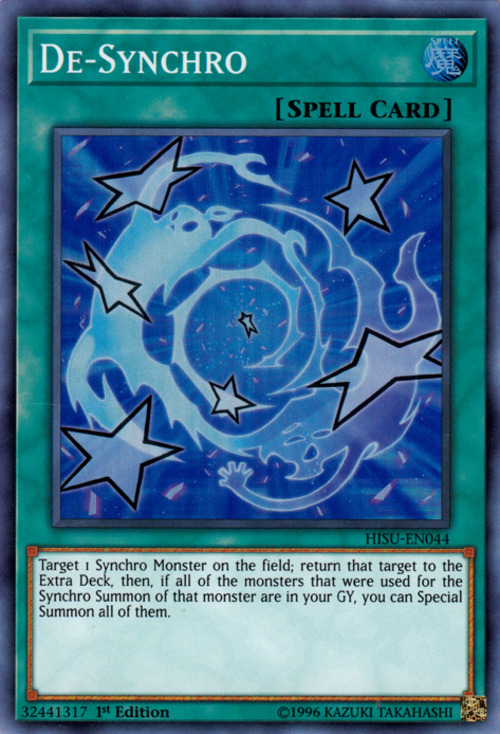 Thus, if "De-Synchro" targets a Synchro Monster which was Special Summoned by using "Eccentric Boy", then the Synchro Monster is removed from play and not returned to the Extra Deck, so you cannot Special Summon the Synchro Material Monsters from the Graveyard. : If "De-Synchro" is activated on a Synchro Monster that used "Eccentric Boy", then can the Synchro Material Monsters be Special Summoned? Stardust Dragon: Suppose that "Stardust Dragon" Tributes itself and then Special Summons itself back to the field during the End Phase. If it is targeted by "De-Synchro", then it returns to the Extra Deck, but you do not Special Summon the Synchro Material Monsters from your Graveyard. : Can you Special Summon the Synchro Materials if "De-Synchro" is activated on a "Stardust Dragon" that Special Summoned itself? T.G. Blade Blaster: Suppose that "T.G. Blade Blaster" banishes itself and then Special Summons itself back to the field during the next Standby Phase. If it is targeted by "De-Synchro", then it returns to the Extra Deck, but you do not Special Summon the Synchro Material Monsters from your Graveyard. : What happens if "T.G. Blade Blaster" is targeted by "De-Synchro" after it banishes and Special Summons itself? "De-Synchro" targets 1 face-up Synchro Monster. If a Synchro Material Monster used in the Synchro Summon is removed from the Graveyard, it cannot be Special Summoned with "De-Synchro", even if it is returned to the Graveyard.